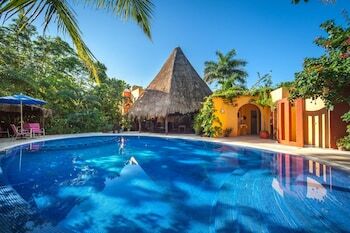 With a stay at Don Diego de la Selva in Tulum (Tulum City-Centre), you'll be a 3-minute drive from Cenote Crystal and 10 minutes from Gran Cenote. Featured amenities include express check-in, multilingual staff, and luggage storage. A roundtrip airport shuttle is provided for a surcharge (available 24 hours), and free self parking is available onsite. When you stay at Hotel Boutique Compañia de Especias in Xochitepec, you'll be next to a golf course and 6 minutes by car from Beraka Adventure Park. With a stay at Hotel Estrella de Oriente in Mexico City (Ixtacalco), you'll be 15 minutes by car from Foro Sol. Free self parking is available onsite. Located in Valle de Guadalupe, Maglen Resort is within a 10-minute drive of Liceaga Winery and Vinas de Garza. Free self parking is available onsite.